Kennedy's career as a political figure began in 1946, when he carried out a vigorous campaign and became the member of the House of Representatives in Congress from the Democratic Party. Having spent three periods in the House of Representatives (1947-53), Kennedy worked as a member of the committees on labor and education. In November 1952 he succeeded in becoming a Senate candidate. 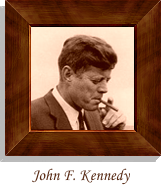 As a senator (1953-61) Kennedy was gradually inclined (although he was charged in the connivance to McCartyism) to the liberal positions, especially regarding the civil liberties and freedoms. He was a member of the Senate committeee on labor and public welfare, and from 1957 - a member of the influential committee on foreign affaris. In 1961 Kennedy became the 35th President of the USA from the Democratic Party. As a President he advanced the program of social and economic reforms in the US Congress in 1947-61. He spoke in favor of strengthening the US military blocs and armed forces. At the same time he was inclined to the more realistic course in the relations with the USSR. He was the youngest American President, and also the only catholic president in all US history. Kennedy knew how to overcome the inertia of "the Cold War". He was able to soften the international tension due to his state wisdom.